Update [2/4/2010]: Follow annual flower research at Bluegrass Lane on Facebook. Images, ratings and other data from the 2009 annual flower trials at Bluegrass Lane Turf and Landscape Research Center are now available online. 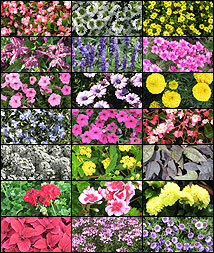 The 2009 trials tested nearly 200 cultivars of recently released or not-yet-available annual flower and foliage plants. Researchers and staff photographed and rated each cultivar through the growing season on flowering impact, foliage, uniformity and overall landscape value. The cream of the crop — best overall, best in category and honorable mentions — are featured on the site’s Recognition page. The Atlantic columnist and gadfly Caitlin Flanagan created quite a stir with her column Cultivating Failure: How school gardens are cheating our most vulnerable students, published in the magazine’s January/February issue. Flanagan’s main point is that California’s innovative and extensive school garden program not only doesn’t help improve students’ test scores, but might be particularly detrimental the system’s marginally performing students. Read the Program’s full response on the Garden-Based Learning blog. Visit the Cornell Garden-Based Learning Program website to read about studies documenting the benefits of garden-based learning. Thursday, January 28, 4:30 to 5:30 p.m.
Plant Sciences student lounge and adjacent Room 151 Plant Science. Find out about courses you may not know about and want to take. Learn from other students what the course descriptions really mean. Ask all sorts of course-related questions of your peers. Kick off the semester with pizza, friends and great info you can use. Join Horticulture graduate student Chad Miller for a lecture on the detailed history of the tulip, from its origin in Asia, to modern cultivation, to a bouquet on your table. This event is part of the Light in Winter festival. Open to Public, Alumni, Students, Faculty, and Staff. Less erosion and improved soil health. Greater planting flexibility early in the season. With new funding from the New York Farm Viability Institute and a Specialty Crop Grant from the New York State Department of Agriculture and Markets, the project will provide growers with information, technical assistance and equipment cost-share funds to test reduced tillage on their farms. Locating equipment to test reduced tillage has been a barrier for many growers. To help, the project team is working closely with equipment dealers who can rent equipment for testing. Reduced Tillage and Soil Health Sessions at the Empire Fruit and Vegetable Expo on Jan 27. Planning the Transition to Reduced Tillage Systems: Equipment, Fertility and Weed Control, a video conference offered at four locations around the state on Feb. 11. Planter Clinics at three locations in February to help vegetable growers make their planters work optimally in reduced tillage systems. Contact your local Cornell Cooperative Extension educator, Anu Rangarajan (ar47@cornell.edu) or Betsy Leonard (bai1@cornell.edu) in Cornell University’s Department of Horticulture if you are interested in participating in the project or have questions regarding reduced tillage. For more information including videos, fact sheets stories from other growers who have transitioned to reduced tillage and more events as they are scheduled, visit the team’s Reduced Tillage Vegetables website. The guides provide suggestions on everything from variety- and site-selection to soil health and nutrient management. The bulk of each provides recommendations for how to manage insects, diseases, weeds and other pests using organic practices. Funding for the guides was provided by the New York State Department of Agriculture and Markets, and is part of a series of organic production guides produced by the New York State IPM Program. Tim Weigle and Juliet Carroll of the NYS IPM Program served as coordinating editors for the grape guide, which included other contributors from Cornell and Penn State Universities. “We were also fortunate to have four organic grape growers from across New York State who provided their expertise in creating this publication,” notes Weigle. Gregory Peck and Ian Merwin in Cornell’s Department of Horticulture were the primary authors and coordinating editors for the apple guide, which also included contributors from other Cornell units. The Cornell Small Farms Program is seeking an Extension Associate to join our staff. Interviews will begin late January. Cornell’s oldest and least energy-efficient environmental growth chambers — some dating back to the 1950s — that are used for research in the College of Agriculture and Life Sciences (CALS) will soon get an extensive makeover that are expected to save $156,000 annually in electricity costs and reduce annual carbon dioxide equivalent emissions by an estimated 721 tons, thanks to a timely grant from the New York State Research and Development Authority (NYSERDA). “Creating a fruit salad for the eyes, Cornell has developed — and patented — a new ornamental flower. 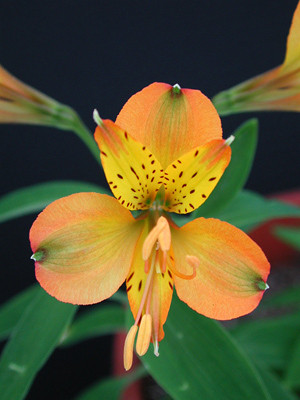 “Alstroemeria ‘Tangerine Tango’ is a new, winter-hardy Inca lily with vivid orange petals, intense lemon-yellow highlights, little flecks of brown and a hint of lime tint. The plants begin to flower in June and shoot new stems for months until the first freeze of fall. “When cut, these flowers will last two weeks in a vase. ‘Tangerine Tango’ is hardy to Zone 5 and available through nurseries and mail order companies including White Flower Farm, Brent and Becky’s Bulbs, McClure and Zimmerman Bulbs, and Roots and Rhizomes. The fellowships are intended to provide California policy makers with unbiased scientific and technical advice on issues before the state Senate and Assembly, said Lora Lee Martin, the director of the fellowship program. Foundations are funding the $7 million worth of fellowships. Jessica will be lending her talents to the Natural Resources Committee.